It started two summers ago, there was something wrong with the Phlox. It looked anemic. Hovering around it were several small interesting looking bugs. It was a fast moving bug and I could never get a photo of it. An Internet search revealed some information about phlox diseases...one was a really bad mosaic virus that I knew I didn't want in the garden. At the time I could find nothing about a bug that was a phlox pest. I even searched databases of beetles and other flying insects. I couldn't identify it from the photos. Last fall, terribly frustrated, I again typed phlox and bug into my favorite search engine and found that the Kemper Center (Missouri Botanical Garden) had a page on the Phlox Bug. The photo was a perfect match. At the last Perennial Plant Society meeting a gardening friend and I were talking about the Phlox pilosa I had given her several years before. As conversations with gardeners go, I asked if she had been plagued by Phlox Bug and she said last summer was the first year. Another friend said she noticed the bug and damaged leaves on P. paniculata 'David'. Neither gardener seemed to know what to do. In my garden it has only affected the summer phlox, Phlox paniculata, for which I am very grateful. It's bad enough on the tall gal but the P. pilosa is everywhere and it would be hard to treat. From what I've read, this bug appears to be a serious problem in the Eastern US. This may seem early to start talking about this problem, but the phlox is greening up and I know I have to be vigilant. That means I will be down on hands and knees looking at the leaves with a magnifying glass if I have to! The garden is not the same...butterflies will not be visiting here if there is no summer phlox. Have any of you experienced this problem and what did you do to solve it? I don't usually copy and paste from other sites, so I hope you don't mind that I did this time. When it's factual info like this, how could I improve on the writing? Thank you, Kemper Center staff. I miss my phlox, I am hoping it revives. The italicized comments are mine! 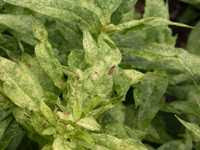 The phlox bug’s feeding causes white or light green spots on the leaves and buds that later show yellow stippling. The leaves then turn brown, curl, dry out and drop. The plant may become stunted and die. 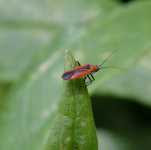 The bug feeds on leaves, stem terminals, flowers and seeds. It may be hard to see because it hides on the underside of leaves. It's true they move fast and disappear when ever there is movement near by. The phlox bug overwinters in the egg stage in dead phlox stems. It has two generations per year. The first generation appears in late spring, the second in mid to late summer. It undergoes incomplete metamorphosis. As if one generation wasn't enough. Here is the best reason to clean out the garden bed every fall! I often waited until spring. 1. Practice good sanitation. Cut back and dispose of badly infested stems and leaves. Clean up stem and leaf litter in the winter. I cut back every stem I could find and threw them in the trash. 2. Scout for nymphs and treat. Apply insecticidal soap to both the upper and underside of the leaves. Use a light horticultural or sunspray oil. I look everyday for signs of infestation, so far nothing....but I am not convinced that they are gone. 3. Use chemical controls if warranted. Products listed for use include pyrethrins, permethrin or acephate/orthene, a systemic. I am hoping that being vigilant and catching the bug early means I won't have to use these bigger guns. Oh boy, sounds nasty. The proble I have had with Phlox is the deer like the flowers! learning something new everyday. i will be on the lookout for this bug. i have never heard of it. I didn't know I had this little bug until you just educated me on it. Thank you. I've seen the leaves on my Phlox go yellow and fall off just as you described. I'll use my soap recipe if I see the little bug in my new garden. You did know that not all soaps are the same right? If not--read the article on my site about making insecticidal soaps. Great article and thanks for sharing. Thanks for the information. I like your blog! Argh! More bugs! yesterday I was hosing down the evergreens, they don't look quite the right color to me. The drought may be taking its toll on many large trees and shrubs, we continue to not have enough rainfall, and the damage may be beyond repair. 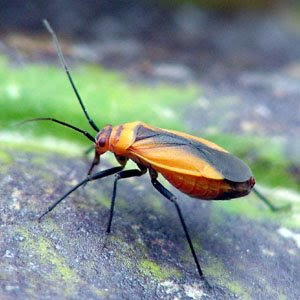 The bugs attack when the plants are weakened. Look out! Maybe you won't get it! Some people don't seem to have a problem. Your Welcome and I hope you come back. Argg is right...Bugs, the drought, it was a hard year. I thought we were still low on rain...I noticed that the soil everywhere had cracks in it. We are getting some right now maybe it will make it to your part of Tennessee! I've seen that bug before! I was never aware of the damage it could do though. I had lots of creeping phlox at my other house and never really saw any real damge to it. Maybe they didn't bother one specific plant enough? Oh no not another bug to worry about! I will keep a lookout. Let us know if anything you try works. How about neem? Maybe that would work. A summer without phlox would be dull indeed! I don't know if it's on creeping phlox, we can hope not. I will keep you posted. Phlox is an important in this garden and would be greatly missed. Gail .. another reason I fear phlox ! eeekkkkk ! .. actually I have moss or creeping phlox .. with needle like foliage .. but .. I swear I might have seen that bug roaming my garden .. have to watch for that .. it must like other plants to plague .. speaking of plague (spelling doesn't look right ) hum .. when you typed MOSAIC as in disease .. another EEKKKKKKKKK ! .. I thought a few years ago that was in my garden .. I think I have a problem getting hysterical about problems in my garden .. good thing we have a short season ! Having chocolate with that coffee ? when i thought it was a mosaic virus, i thought my garden was over....there is along list of plants it would affect...I think it might be a nursery problem who knows. Technically no chocolate, but I did have ice cream for breakfast, java chip. Nasty little bug! I think I've seem them before although I can't be sure. Insecticidal soap should do the trick I would think. I use this stuff from Safer that works really well and is organic. Glad to know you like the insecticidal soap...if they show up I will squirt them! Or do you use it as a preventative move? Thank you for the warning! Very useful post indeed! available right noѡ. (from whɑt I've read) ӏs that what you are uding on your blog?